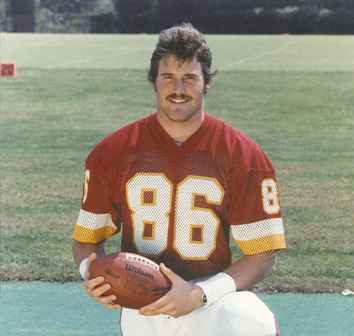 So the 49ers are growing throwback mustaches to go with their throwback uniforms this Sunday, which has prompted an outbreak of Redskins Mustache Nostalgia. Leading the photographic charge is Mr. Irrelevant, with the Sports Bog combing through the archives for text ‘staches. The Clint Didier picture above is my contribution. Riggo’s Rag argues both sides of keeping Coach Zorn, while Fatpickled takes a bittersweet run through the ifs of 2008. The epic struggle of Chris Cooley attempting to conquer a gingerbread house. Oh, and also: FOX 43 in Hampton Roads, Virginia, will still be broadcasting the Redskins game, even after the flexing of the schedule. Just a public service announcement to save people from having to call the station. hmmm. Since we are playing the Niners, I hope they SHOW the GAME in HAWAII this time! If not, I’ll pile back into the car, put up the flags and find the game in town somewhere. Hey Matt, while I’m thinking about it- please encourage the powers that be to be sure the team is wearing their lucky white pants on Sunday, k? I didn’t even realize they were thinking about not showing the Skins game down here in VA Beach. I’d have been a little miffed. I HEART Clint Didier. He and Donnie Warren. WOWZA! Those were the days. As an Australia-based ‘skins fan, I found your blog on google and read a few of your other Redskins posts. I just added you to my Google News Reader. Keep up the good work. Look forward to reading more from you in the future.